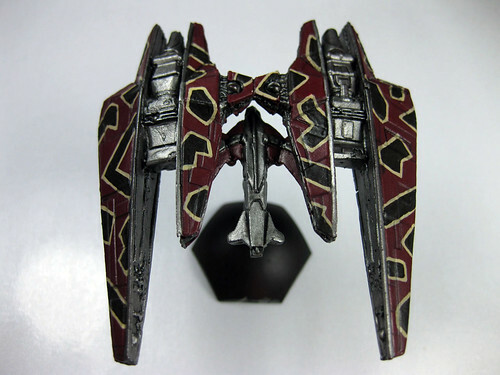 Painting the iconic Narn pattern on a ship can be intimidating, before I painted my first one I did a lot of research on how other people managed theirs. It takes some patience but overall isn’t difficult, and is totally worth the effort. 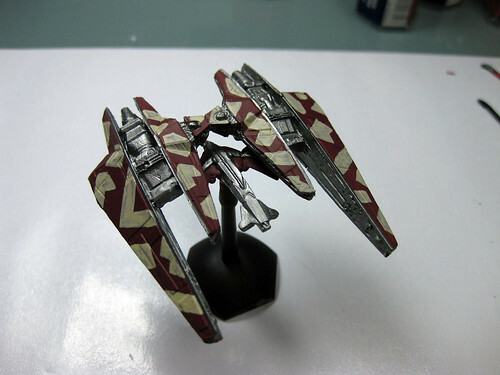 The paint scheme that I picked out for my Narn ships is fairly simple, but I think works quite well. While this ship was done entirely with Games Workshop paints, I also use Vallejo, Tamiya, and have started playing around with artist’s paints from the local art store. I tend to paint my miniatures on the darker side, I almost always start with a black primer, and pick fairly dark shades as the base colour. 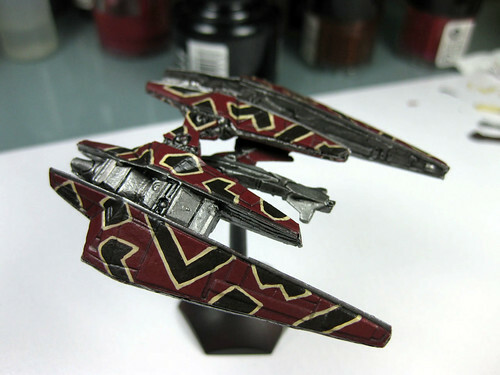 I like the grittier look to anything I paint, especially spaceships. To me space is lonely, dark, and cold, and I want anything I paint to fit into that picture. 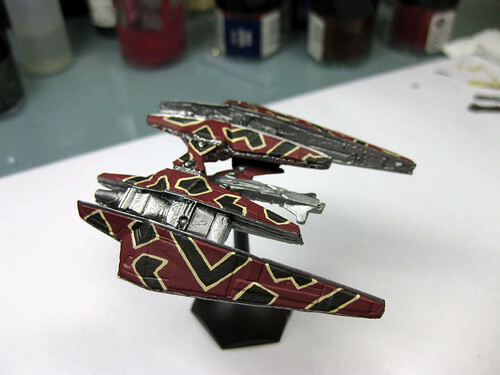 So for this ship I started with a base coat of Scab Red, applied with my airbrush. I find that this is pretty much the only way to apply a red base coat, applying red to anything is a pain, but even more so when trying to cover a black primer. Using a hair dryer on low to speed up drying, I applied four thin coats. 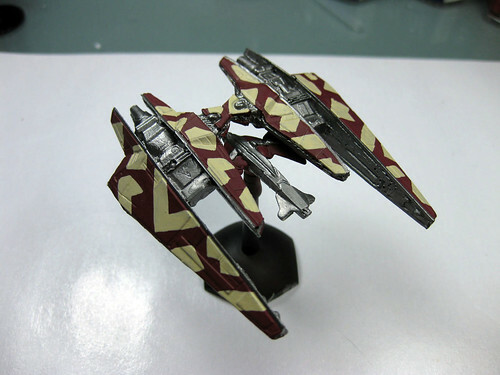 Next I start applying the geometric pattern that makes any Narn ship so unique. I use a thined Bleached Bone for this, white would be too much of a contrast, and I need something that I can highlight later. The actual pattern is purely freehand, with no real planning, I just sit down and start. 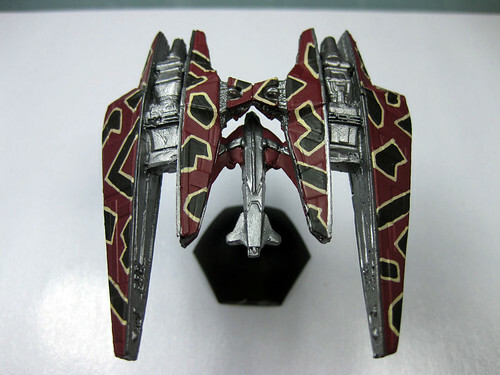 To help me out I surround myself with reference material, I have any previous Narn ship I have painted, and on my netbook a number of images of either shots from the tv show or miniatures that others have painted. This way anytime I get stuck as to the next shape I should stick in I just look around. To stop myself from being to repetative I make sure to start at a different place on eash section of the ship. After laying down the first coat of Bleached Bone, I quickly went in with Boltgun metal and gave all the appropriate parts a coat, and then set it aside to dry. I then applied a second coat of the Bleached Bone, the first coat is quite thin, which is necessary for me to have the control that I need to put it down correctly. The second coat also allows me to tighten up some of the lines from the first go through. The second coat is also fairly thin, and I don’t need to worry too much about coverage as most of it will be covered with the next step. For the second part of the geometric pattern I use a mix of Scorched Brown and Black, probably 2:1, but really just done by eye and thinned with water. Again straight Black would be too dark, and then the highlights would be grey based, and I prefer brown shades. This is also applied in two thin coats. I don’t have a photo of it, but the first coat left too much of the Bleached Bone showing, so the second coat was really necessary. This is the coat that takes the most patience, however mistakes can be fixed quite easily with touch ups. The next steps were a couple of washes. I use a wash that is a mix of glaze medium, water, black ink, and a little future acrylic floor polish. I applied this straight, to everywhere but the metalic parts, and once dry I returned with a little more into some of the darker crevasses. For the metal, I added a drop of black ink to four of five of the normal wash, and then heavily diluted it with water, this was then liberally applied. I would return with a dry brush to soak up any excess to avoid getting tide marks when it dried. This was then left for a day or two to properly dry. The glaze medium makes the entire miniature shiny, and helps to seal/protect the previous coats of paint. Next post I will cover the highlighting and finishing steps. This entry was posted on March 6, 2011 by triplezeropainting. 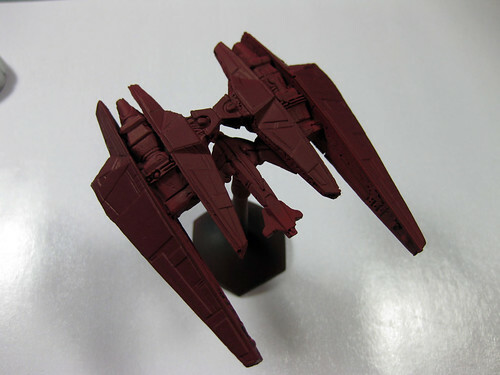 It was filed under Babylon 5 Ships and was tagged with B5, Narn, Spaceship Miniatures.